I've just added this elegant necklace in all-natural tones of freshwater pearl to my Artfire shop. The pearls are handknotted on silk with a sturdy vermeil clasp. The blend of natural peach, mauve, pink and cream means that this necklace complements all skin tones. I have put the matching earrings on classic vermeil leverback findings but these can be changed for stud or french wire fittings. I loved the look of this penal cross, which comes both in sterling silver and in bronze, it has an almost Egyptian feel with the symbols of crucifixion reminding a little of Egyptian hieroglyphics. It is a copy of a wooden Irish penal cross dating back to 1722, the original to be found in the Hunt Museum in Limerick, Ireland. Penal Crosses typically had short arms as they were held in the palm for concealment because of the religious persecution of the times, and longer arms tended to break off. They tended to be one-decade beads, with a ring to slip from finger to finger to keep track of the decade being said. 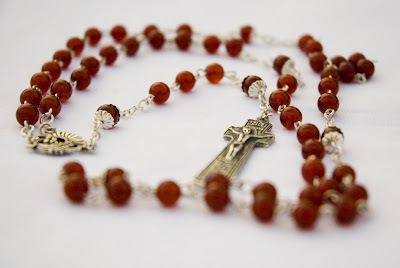 I am shortly going to make some of these one-decade rosaries. 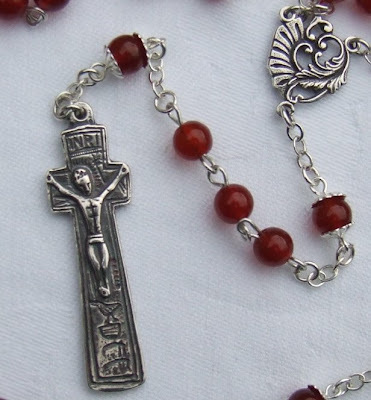 My intention in offering rosaries with a penal cross is that they be used with forgiveness in mind. I certainly do not want to encourage anyone to hold on to old bitterness which has a corrosive effect on the soul. I think the stunning sizzling colour of the carnelian helps to underling the positive uplifting intention.